For the most part, my taste for pop punk was left behind about 13 years ago. I enjoy the grittier stuff though, like Iron Chic or Not the Bees. The super happy, poppy sound is hard for me to feel at home with these days though. 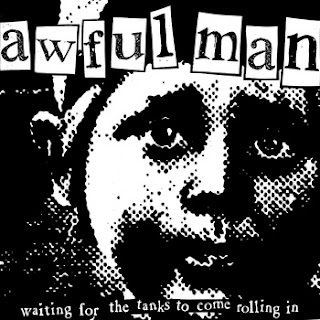 Awful Man seems to straddle the fence between that Dillinger Four-esque grit and some of the more obnoxiously poppy fare that I find a little too much to take. "This Cause Won't Lose Itself" starts off on a fast note, and melodic guitar work. The vocals have me confused, mainly because at times I'm hearing some of that rough style that I like, but other times it falls into that NOFX territory that sounds less than desirable. The song takes a nice slow turn though and dishes out some impressive hooks and good style up until the end. "Running Up the Tab" beings with an overly peppy strut, only broken up by some nice powerful hits around 1:10. The song breaks later to let some clean guitar take center stage and build us up to the conclusion. It blasts back in at full speed and we end with a nice mid tempo stomp and dual vocals. The production here is a little rough, but you can hear all the instrumentation fairly well. After a few listens I find myself enjoying it a little more each time. Who knows, maybe this band will have me back in the pop punk saddle after all.